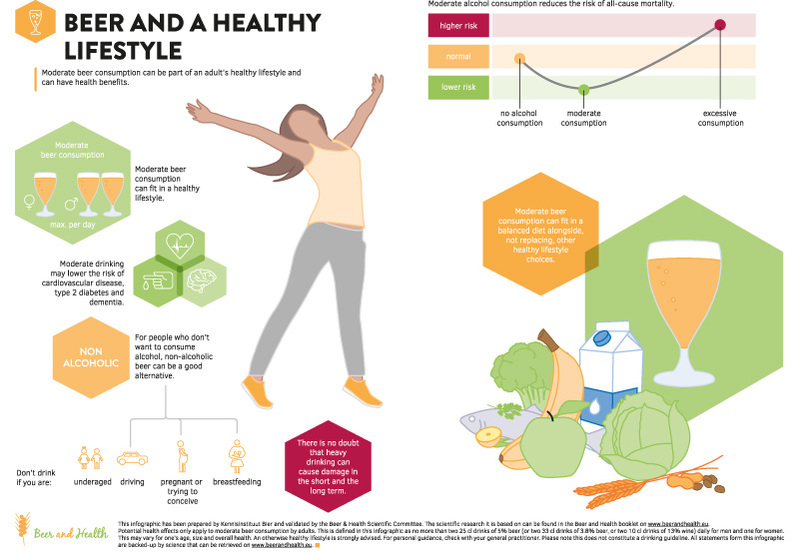 This booklet summarises the relevant scientific literature on moderate beer consumption in relation to health, but there are some aspects you have to take into consideration while reading it. Generally, beer usually contains alcohol and this is responsible for some beneficial health effects provided that it is consumed in moderation, i.e. up to two drinks per day for adult men and up to one drink per day for adult women. There is no such thing as a standard drink, though this booklet defines ‘a drink’ as one that contains 10 grams of alcohol. For some groups and in some circumstances, such as for those under the legal purchasing age, when driving, when operating machinery, before physical activity such as sports, when taking certain medication, for women during pregnancy or who are trying to conceive or are breastfeeding, for patients with past alcoholism or liver, gastrointestinal or pancreatic disease, it is better not to drink any alcoholic beverages at all. When in doubt, it is recommended that you check with your general practitioner for personal guidance on drinking. Beer usually contains alcohol, and alcohol is responsible for some positive health effects provided that it is consumed in moderation. Therefore, some of the chapters in this booklet are about the consumption of alcohol in general, and the effects of alcoholic beverages other than beer are also mentioned. Of all alcoholic beverages, beer is a beverage with a relatively low alcohol percentage (on average 4–5%). 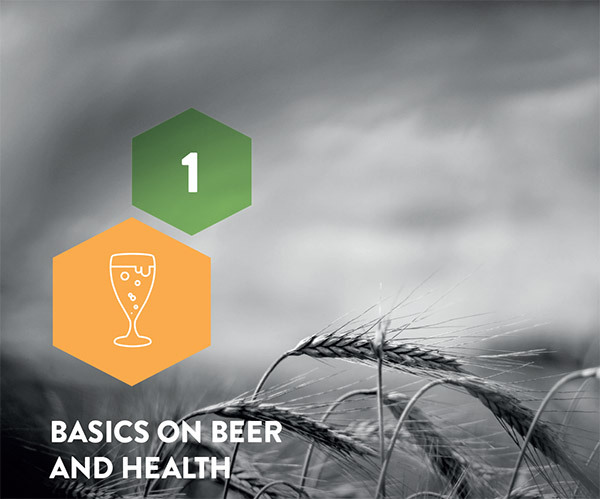 Other chapters thus focus on the potential health effects of beer as derived from the natural raw materials from which it is brewed. Years of scientific research suggests that the regular consumption of beer, up to two glasses per day for adult men and up to one glass per day for adult women (while avoiding excessive drinking) can have a protective effect on health. However, this statement may not be generalised to the overall population since some individuals may have a family or medical history or a certain lifestyle which counters the general trend. That is why in the text, words like ‘may’ and ‘potential’ are often used. When in doubt, it is recommended that you check with your general practitioner for personal guidance on drinking. A characteristic of scientific research is that the results of new studies can change insights, but only when there is enough evidence advice will change. In this booklet, the current state-of-the-art insights based on the most recent evidence are presented. Recommendations on the safe limits of alcohol consumption vary from one country to another (see Figure 1), and range from a maximum of 8–40 g per day. Also, the amount of alcohol in any one ‘standard’ drink varies considerably depending on the size of the glass and the strength of the beverage, differing across Europe according to historic traditions and customs from 8–20 g per drink. To be specific about the amount of alcohol that is responsible for certain health effects, grams of alcohol are used in this booklet. In this booklet, moderate alcohol consumption is defined as the regular consumption of alcohol up to 20 grams of alcohol per day for adult men and up to 10 grams of alcohol per day for adult women (while avoiding excessive drinking) (see Chapter 10), taking into account a range around the optimal moderate consumption levels. Individuals often consider alcohol consumption in terms of ‘drinks’ rather than grams of alcohol consumed, but there is no such thing as a ‘standard drink’. The sizes and strengths of drinks vary from country to country, from drink to drink, and from consumer to consumer. To be as objective and informative as possible, this booklet uses the term ‘a drink’ to describe one that contains 10 grams of alcohol. Table 1 shows the size of different drinks containing different levels of alcohol by volume. For some groups and on some occasions, it is better to drink no alcoholic beverages at all. This applies in the following circumstances. Also, people who do not drink alcoholic beverages are not encouraged to start drinking them (even in moderation) for health reasons. Alcohol consumption can in some cases lead to addiction and excessive use which is harmful to health. * The legal purchasing age for beer is between 16 and 18 years old in different European countries. In health science, different types of studies are used to analyse and understand the patterns, causes and effects of health and disease conditions in defined populations. Figure 2 shows the strength of conclusions from different studies. In a population study, for example a cohort study or case control study, a large group of people is followed over a long period of time to try and identify any common (lifestyle) factors that people who get a certain disease may have. However, as scientists cannot control all factors during such studies, some may be overlooked or incorrectly linked to certain disease risks, and so proof of causality cannot be proven with a population study. In an intervention study, for example randomized controlled trials, (lifestyle) factors are deliberately varied in subjects to see if these cause any effect. Intervention studies may provide insight into the biological mechanisms by which selected (lifestyle) factors affect a disease. 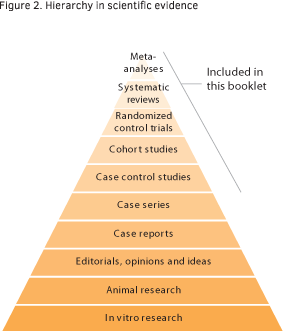 A systematic review is a thorough, comprehensive and explicit means of integrating and analysing the existing scientific literature in order to try to identify stronger associations. A meta-analysis is a statistical approach to combine data derived from a systematic review, though not all data from systematic reviews are suitable for meta-analysis. In this booklet you can read about beer consumption lowering or increasing the risk of suffering from certain diseases. It is important to understand that these numbers present relative risks. For example, someone can have a 20% risk of getting a disease, and moderate beer consumption may lower the risk by 10%. This means that the risk is reduced by 2% (10% of 20), i.e. from 20% to 18% when drinking beer in moderation, and not that the risk is reduced to 10%. Equally, when talking about increased risk it is important to know what the existing risk is in order to understand the scale of the issue. Although nowadays beer and wine are consumed in all countries and both excessive and moderate consumers are found in all countries, drinking cultures do still vary from one country to another. So it remains impossible to talk about the European consumer as one homogenous type of drinker.